In the fifteenth and sixteenth centuries, the Inca Empire was the largest South America had ever known. Centered in Peru, it stretched across the Andes' mountain tops and down to the shoreline, incorporating lands from today's Colombia, Chile, Bolivia, Ecuador, Argentina and Peru - all connected by a vast highway system whose complexity rivaled any in the Old World. Rich in foodstuffs, textiles, gold, and coca, the Inca were masters of city building but nevertheless had no money. In fact, they had no marketplaces at all. The Inca Empire may be the only advanced civilization in history to have no class of traders, and no commerce of any kind within its boundaries. How did they do it? Many aspects of Incan life remain mysterious, in part because our accounts of Incan life come from the Spanish invaders who effectively wiped them out. Famously, the conquistador Francisco Pizzaro led just a few men in an incredible defeat of the Incan army in Peru in 1532. But the real blow came roughly a decade before that, when European invaders unwittingly unleashed a smallpox epidemic that some epidemiologists believe may have killed as many as 90 percent of the Incan people. Our knowledge of these events, and our understanding of Incan culture of that era, come from just a few observers - mostly Spanish missionaries, and one mestizo priest and Inca historian named Blas Valera, who was born in Peru two decades after the fall of the Inca Empire. 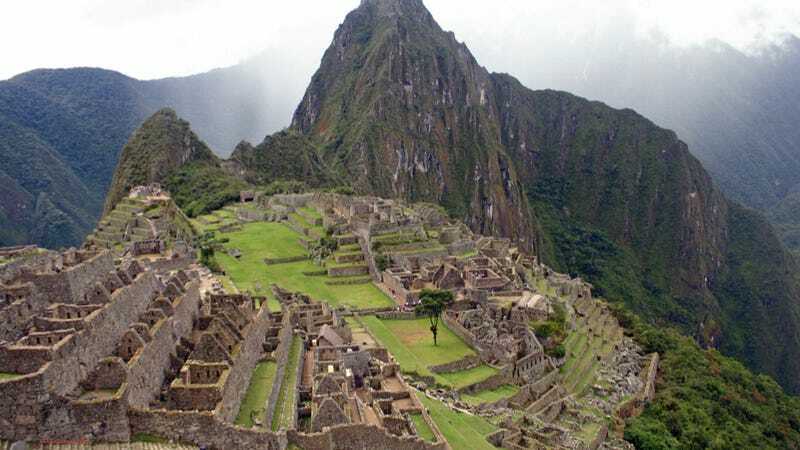 Documents from missionaries and Valera describe the Inca as master builders and land planners, capable of extremely sophisticated mountain agriculture - and building cities to match. Incan society was so rich that it could afford to have hundreds of people who specialized in planning the agricultural uses of newly-conquered areas. They built terraced farms on the mountainsides whose crops - from potatoes and maize to peanuts and squash - were carefully chosen to thrive in the average temperatures for different altitudes. They also farmed trees to keep the thin topsoil in good condition. Incan architects were equally talented, designing and raising enormous pyramids, irrigating with sophisticated waterworks such as those found at Tipon, and creating enormous temples like Pachacamac along with mountain retreats like Machu Picchu. Designers used a system of knotted ropes to do the math required to build on slopes. With only a few exceptions found in coastal polities incorporated into the empire, there was no trading class in Inca society, and the development of individual wealth acquired through commerce was not possible . . . A few products deemed essential by the Incas could not be produced locally and had to be imported. In these cases several strategies were employed, such as establishing colonies in specific production zones for particular commodities and permitting long-distance trade. The production, distribution, and use of commodities were centrally controlled by the Inca government. Each citizen of the empire was issued the necessities of life out of the state storehouses, including food, tools, raw materials, and clothing, and needed to purchase nothing. With no shops or markets, there was no need for a standard currency or money, and there was nowhere to spend money or purchase or trade for necessities. So the Inca did engage in trade, but only with outsiders - not among themselves. The secret of the Inca's great wealth may have been their unusual tax system. Instead of paying taxes in money, every Incan was required to provide labor to the state. In exchange for this labor, they were given the necessities of life. Of course, not everybody had to pay labor tax. Nobles and their courts were exempt, as were other prominent members of Incan society. In another quirk of the Incan economy, nobles who died could still own property and their families or estate managers could continue to amass wealth for the dead nobles. Indeed, the temple at Pachacamac was basically a well-managed estate that "belonged" to a dead Incan noble. It's as if the Inca managed to invent the idea of corporations-as-people despite having almost no market economy whatsoever. One of the outstanding questions for scientists and historians who study the Incas is why this wealthy, sophisticated culture developed scientifically and culturally without ever inventing markets. One possibility is that life was so difficult to sustain in their environment that all their innovations revolved around agriculture rather than economics. In other words, the Inca Empire was optimized to prevent starvation rather than to foster trade. A few years ago, a group of archeologists took core samples in Cuzco valley in Peru, and found evidence for thousands of years of agriculture in the area, including animal husbandry, most likely of llamas. In a paper summarizing their findings, archaeologist A.J. Chepstow-Lusty and his team suggested that the Incas focused their technological and cultural institutions around food production and land management, rather than market economies. This may have been necessary in a region where droughts had likely wiped out a previous civilization (the Wari), and where climate fluctuations were a constant hazard. The rise of the Inca Empire coincided with a period of relative climate stability, but the peoples in the area would be well aware that this temperate spell could end at any time. The scale of anthropological manipulation and transformation of the landscape in the south-central Andes appears to have increased after ca. AD 1100, probably in response to a climatic backdrop that was relatively warm, dry and essentially stable. The development of major irrigated terracing technology may have been increasingly necessary in these regions to obviate conditions of seasonal water stress, thereby allowing efﬁcient agricultural production at higher altitudes. The outcome of these strategies was greater long-term food security and the ability to feed large populations. Such developments were exploited by the Inca of the Cuzco Valley, who were emerging as the dominant ethnic group of the region as early as ca. AD 1200. A healthy agricultural surplus supported their economic and political potential, enabling them to subjugate other local independent states and to effectively centralize power in the Cuzco region by ca. AD 1400. So how do you become a continent-dominating empire without cash? In the case of the Incas, it's likely that the technologies that granted them agricultural surplus (extra food and textile materials) helped them with their expansive empire-building. Food was their coin; pure labor structured their economy. Some have argued that the Inca Empire was the ideal socialist state, while others have called it an authoritarian monarchy. In truth, the Inca probably created an empire like many others. Its leaders were distracted by civil war and internecine squabbles among the nobility. And its slaves and laborers built the dramatic works dreamed up by pre-Columbian civil engineers. What's remarkable is that evidence suggests those slaves and laborers were probably well fed. Perhaps more remarkable, in this era where markets are associated with civilization, is the idea that an empire could achieve so much without ever spending a dime.